This article is for Nokia 5233 Touch Screen Problem Solution. If your phone’s touch screen stops working solutions in the diagram below can help you. Touch screen problem in Nokia 5233 can often be caused by damaged touch screen connector so make sure that it is in good condition. Clean it and the general area around it with any cleaning substance just to make sure that moisture or carbon is not causing this problem. 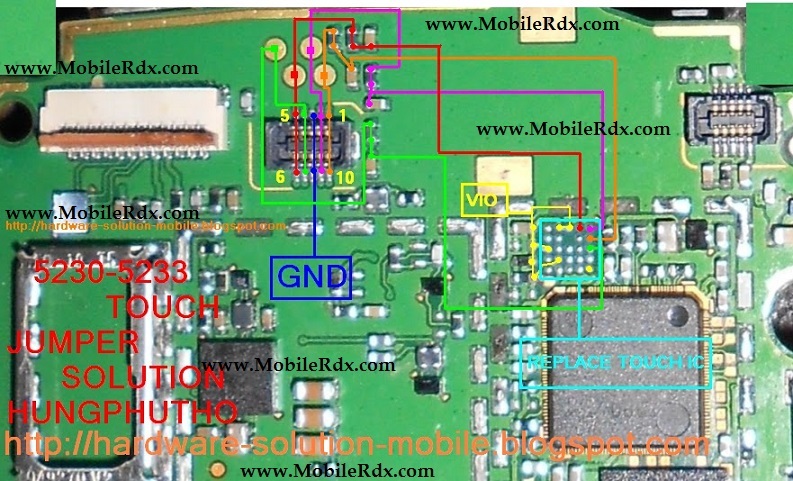 I have marked Nokia 5233 Touch Screen Connector Track Ways in the diagram below. Make the jumpers as shown in it but If you are sure that the Connector is in good shape then repair or replace the Marked IC. Here Are Solution Please Obseve Carefully. Note: Every diagram we post on repair-mobiles.com is tested by one or more members of our team. Still Use them at Your Own Risk we are not responsible if these solutions may cause any harm to your phone. sir. I need the pin out diagram of nokia 5233 since i am planning to use its LCD in my electronics project. Please send me other data related to 5233 LCD if you have it.